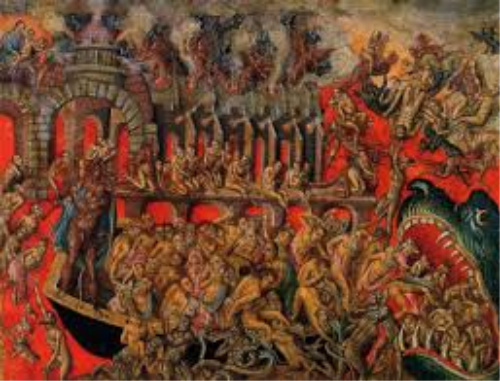 The Dogma Of Hell: Hell is the Receptacle of All the Moral Filth of Humanity. BeautySoAncient January 31, 2019 January 31, 2019 No Comments on The Dogma Of Hell: Hell is the Receptacle of All the Moral Filth of Humanity. We don’t discuss the dogma of hell as much as we should. And yes, it is a dogma. In fact, we don’t discuss the “Four Last Things” very much. It’s not fashionable. The thought of it is unpleasant. Yet, the desire to NOT end up in hell, has inspired many Saints to live holy lives. If you are not used to reading about hell, you may experience skepticism. Hopefully you experience fear and a strong desire to not end up in hell. Hopefully you cultivate a real hunger for souls. Imagine all the sins that you try to avoid. Now imagine all of them being concentrated in one area. This is what hell is. “Hell is the sink of the world and the receptacle of all the moral filth of humanity. There, impurity, intemperance, blasphemy, pride, injustice and all the vices which are like the rottenness of souls, are found heaped up. To this moral filth a corporal stench is added more insupportable than all the stenches of hospitals and corpses. 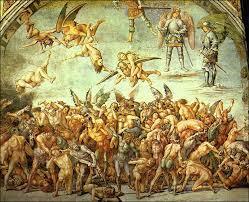 “Another torture of hell is the horrible society of the devils and the damned. There are some wretched sinners who, seeing plainly that they are walking toward Hell, are comforted by saying, “I shall not be there alone!” Sad consolation! It is that of the convicts sentenced to wear irons together in the galleys. themselves happy to have tigers and lions for companions, rather than their relatives, brothers, or their own parents. Do you wish to see the poverty of hell and the privations that are suffered there by those who made the goods of this world their god? Consider the wicked rich man of the Gospel. “There is no light,” writes St. Teresa (Autobiography, Chapter 25), “in the eternal pit, only darkness of the deepest dye; and yet, O mystery! Although no light shines, all that can be most painful to the sight is perceived. Among those objects which torture the eyes of the damned, the most frightful are the demons, who reveal themselves in all their hideousness. Let us resolve to live holy lives and make use of the sacraments, often. “The Dogma of Hell, Illustrated by Facts Taken from Profane and Sacred History.” by Rev. Father Francois Xavier Schouppe, S.J.